This week's doorway is one of the many beautiful doorways I found in Prague last spring. 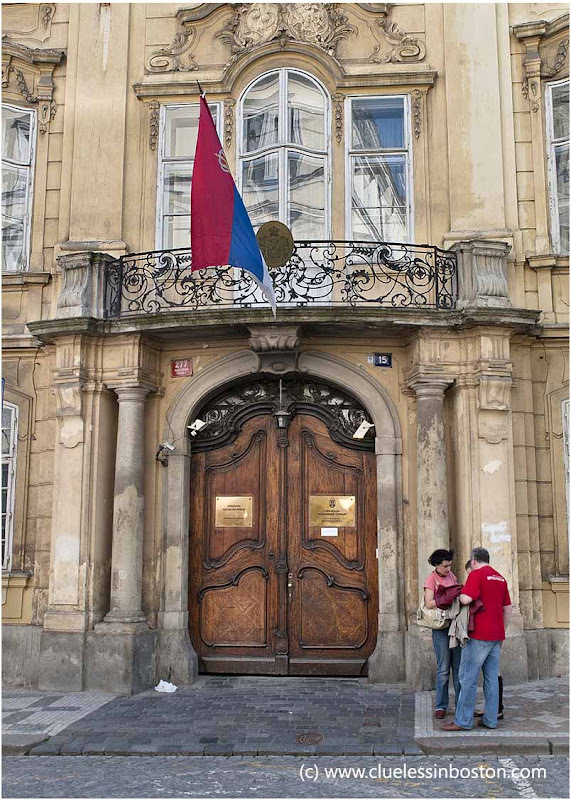 I believe it is the Serbian embassy and hope someone will correct me if I am wrong. There is no shortage of doorways in Boston, I just found myself short of time this week. Just love the wood on this door, great pattern and patination. Now that is an impressive doorway! I like those reflections in the windows too. I have a friend living in Prague, who used to have a blog ONLY about the doors of this city!and there are so much wonderful doors there! You found one of them. This is simply absolutely gorgeous! Most imposing - I like the pretty little balcony. Prague is a gorgeous city with loads of wonderful doors, and your choice is superb! Gorgeous and the flag is a nice addition. Our choir toured Prague in July and reported that it was a stunning city. Your photo proves that. This doorway is breathtaking, Clueless. You can fold Prague pictures in any time you want.